AMHERST, Mass. 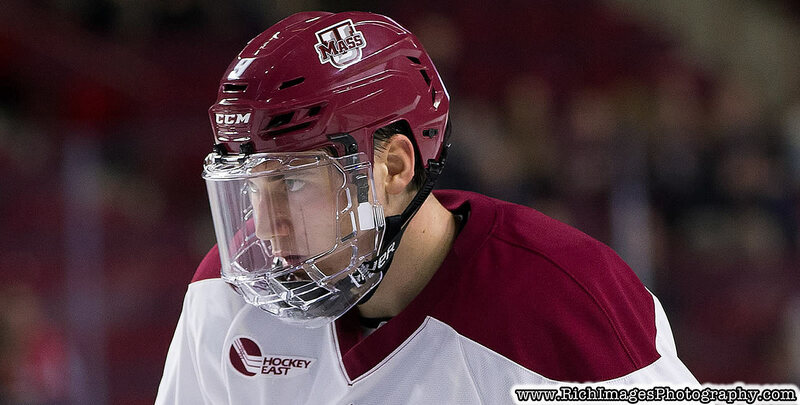 - Sophomore John Leonard's four-point night helped University of Massachusetts hockey roll to a 6-1 exhibition win over Royal Military College on Saturday night at the Mullins Center. Ten different Minutemen notched points in the contest with freshman Marc Del Gaizo (1g, 1a) and sophomores Cale Makar (2a) and Philip Lagunov (2a) all contributing multi-point efforts in the victory. "When you go into these exhibition games, you're not exactly sure what the competition is going to be," said UMass head coach Greg Carvel. "We thought it was going to be a little stronger tonight, but credit to our guys who came out right from the drop of the puck and had a very dominant effort tonight. I was looking for certain parts of the game that we've added to what we're trying to do and the guys did a great job of creating a lot of offense." UMass set the tone early, out-shooting RMC 25-5 in the opening frame and finding the back of the net twice in the period. Del Gaizo began the scoring just 4:05 into the contest, rifling home a wrister from the top of the left faceoff circle off a feed from Lagunov and Leonard down low. The Minutemen tacked on another at the 11-minute mark as Del Gaizo and Leonard picked up helpers after senior Jacob Pritchard put home a rebound. Midway through the second on a delayed penalty call, Leonard drove home a one-timer from Makar and Lagnuov at 9:32. Then with a power play opportunity about to expire, junior Niko Hildenbrand pushed the advantage to 4-0 as his shot from the corner set up by sophomore Mario Ferraro and freshman Ty Farmer deflected home 14:30 into the second. Leonard added his second of the night in the opening minute of the third period on the power play from Pritchard and Makar to make it a five-goal lead. The Paladins would later break up the shutout with a power-play goal of their own 12:58 into the third before freshman Bobby Kaiser capped the scoring at 15:14. UMass' three netminders split the action with sophomore Matt Murray stopping five shots in the first, sophomore Brad Arvanitis turning aside five in the second and freshman Fille Lindberg making four saves in the third. The Minutemen finished with a 56-15 shot advantage and went 2-for-8 on the power play, while RMC was 1-for-4. Over the dots UMass won 47 of 67 draws (70.1%), led by Lagunov (15 for 21, 71.4%) and sophomore George Mika (11 for 13, 84.6%). UMass will open its 2018-19 campaign next Friday, Oct. 12, when the squad will host Rensselaer in the Mullins Center at 7 p.m.